One of the best opportunities to learn about the illegal practice of shanghaiing in the American West is in Portland, Oregon. If you’ve ever heard Portland referred to as the Forbidden City of the West and wondered why, a visit to the Shanghai Tunnels could clear things up for you. Then again, it could just raise more questions about a legend that persisted for over 150 years. If you aren’t familiar with shanghaiing, it refers to the capture and illegal sale of able-bodied men to sea captains in need of crewmen. Unscrupulous (to say the least) middlemen kidnapped men and sold them off to captains for as little as $50 a head. These poor men were then forced to work on ships bound for the Orient with no pay. According to legend as well as some historical data, men were shanghaied in Portland from roughly 1850 to 1941. Things were supposedly at their worst during Prohibition. It almost sounds too bizarre and horrific to be little more than a myth or legend, but shanghaiing did take place. It was a practice that occurred in Portland as well as other locations along the West Coast. What is questioned is the means by which it was carried out in Portland, and the relationship if any between the Portland Underground and shanghai practices. The Shanghai Tunnels or Portland Underground consist of tunnel passages linking Portland’s Old Town (Chinatown) to the central downtown area of Portland. The basements of many downtown bars and hotels were linked to the Willamette River waterfront through the tunnels, allowing supplies to be moved from ships docked there directly to basements for storage. Although many residents used to doubt it was true, the catacombs snaking beneath the city do in fact exist. Since the mid-19th century, stories have been told about shanghai practices in Portland. Not only men but women, too were warned to take care against being drugged or kidnapped and hauled off for sale. Women were allegedly shanghaied for use as prostitutes rather than ship’s laborers. Although other ports along the West Coast including San Francisco are said to have been centers of shanghai activity, Portland’s underground tunnels are claimed to have made the practice much more manageable and wide-spread than in other areas. According to those theories, victims were either drugged, kidnapped while intoxicated or simply knocked out, then dropped or dragged into the tunnels through trapdoors called deadfalls. Once in the tunnels, they were locked in specially designed prison cells and held captive until they were shipped off as slave laborers. During Prohibition, it is said that bars moved their operations underground, as well, making it easier than ever for unsuspecting victims to be shanghaied. Some researchers estimate that as many as 1,500 people a year were shanghaied through Portland’s Underground. Entire scenarios about the practices and experiences of the shanghaied in the tunnels have been created and elaborated on over the years. The catacombs beneath Portland do exist and the stories almost sound plausible, but is the legend true? What evidence exists to support the allegations that these tunnels were used for shanghaiing? Is there any evidence at all? You can take a tour aimed at demonstrating the validity of the Shanghai legend and decide for yourself, but so far the evidence does appear to be scanty to say the least. You can imagine that what is there, could have been created any time rather than during the 19th century. The persistent oral history of the legends is somewhat convincing, but remember historians don’t doubt shanghaiing took place in port cities of the West, including Portland. What they doubt is the connection between the tunnels, the basements of hotels and bars, and the kidnapping. There is no historical record or evidence of shanghaiing being practiced in the tunnels from the time period it is said to have taken place. In fact, the earliest mention of a connection between the practice of Shanghaiing and the tunnels dates from the 1970s. Historians assert that even in the event of a massive cover-up effort, it is unlikely there would be no evidence of the practice whatsoever from the era when it was supposedly at its peak. Evidence may finally be forthcoming, and if it is as convincing as promised, it could settle the question about Portland’s Underground once and for all. Michael P. Jones is the founder of a group offering tours of Portland’s Underground and is a proponent of the Shanghai Tunnel theory. He claims to have obtained indisputable evidence of the practice that will be revealed in a forthcoming book. The evidence supposedly consists of documents, photos and other proof of Shanghai activity. 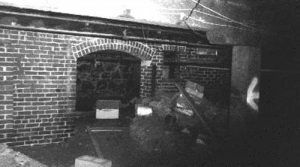 Until the book is released or other proof surfaces, the legend of Portland’s Shanghai Tunnels remains just that – a myth individuals must decide about for themselves. Being able to explore the legend and form your own opinion is of course what makes the Shanghai Tunnels so appealing. If proof finally does come out confirming the story, it’s doubtful it will make the legend any more or less interesting than it already is. One question that will probably come to mind on your visit to Portland’s Tunnels may haunt you more than what you believe you see. 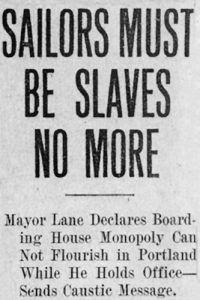 If history already confirms that shanghaiing took place in Portland, why on earth wouldn’t the tunnels have been used as a means of transporting the kidnapped? Valerie Mellema is a freelance writer living in Amarillo, Texas. She loves to travel and is always planning a trip, whether it be a weekend in Dallas, a week in Spain, or a relaxing cruise. Her writing business, Words You Want, provides a variety of writing services including article writing, eBook writing and other writing services on a wide variety of topics. She also has the opportunity to write for a variety of different web sites and clients, such as HotelsCombined.com.